Agreed. A utopia in which everyone can do what they like just won't work. The question is how to give Mars the greatest chance at free, open, limited government that won't be too vulnerable to corruption. 7. Settlement Policy? What's that? Governing who gets to settle where? Good point. So a new embryonic colony is planned on Earth, and early on it applies for a plot of land with the Mars gov, who process the application and say 'yes you can land there and this is your colony area' with coordinates, or 'no, sorry, that's too close to Pavonis Mons' or something, or even 'your equipment and safety standards don't reach our minimum standards - you have to redesign and reapply'. In all these areas the various colonies are going to want to be represented. That's quite a process of system-building. A fair amount of infrastructure goes along with all that #1-7. eg comms sats, office space, storage of emergency supplies, emergency response vehicles & kit, training for volunteers... lots of work to keep some people employed. So who pays? Some sort of ... dare I say it ... taxation? Terrans established a “prime meridian” of Mars in about 1830. However, Martians should have the opportunity to establish the prime meridian of their planet. I believe that the Martian parliament should establish a “Royal Observatory” in the capital city of Mars and vest in the Observatory the power to establish the precise location of the official “Prime Meridian of Mars”. If a global positioning system comes into operation for Mars then the local Base and Meridian established by each settlement could be precisely located in relation to the official Prime Meridian of Mars. But parcel maps and land titles should still be drafted with reference to the local Base and Meridian, as established by municipal law. The central (planetary) government does not need to meddle in the local business of licensing land surveyors and establishing parcel boundaries. The chief administrative officer of the "Mars Secretariat" might make it known that he or she will not issue settlement permits for locations that are likely to be below sea level (when terraforming processes start the formation of seas). After the Parliament of Mars becomes operational, the Parliament could enact laws that regulate the location of new settlements, based of the planned location of seas. Perhaps, I still think there should be some Federal overarching surveying plan to prevent conflicts between different municipalities if/when they expand and meet each other, especially if for example one municipality uses metric and another uses imperial for land measurement. The "Settlement Permit" issued by the Mars Secretariat should specify the maximum size of the settlement. For example, the settlement boundary could include four townships (36 square miles in each township; 144 sq. miles in total). The Secretariat should not allow settlements to expand if the expansion would bring the settlement's boundary into contact with another settlement. There should be a buffer zone (an ecological preserve) between settlements. Here's my Mars flag. 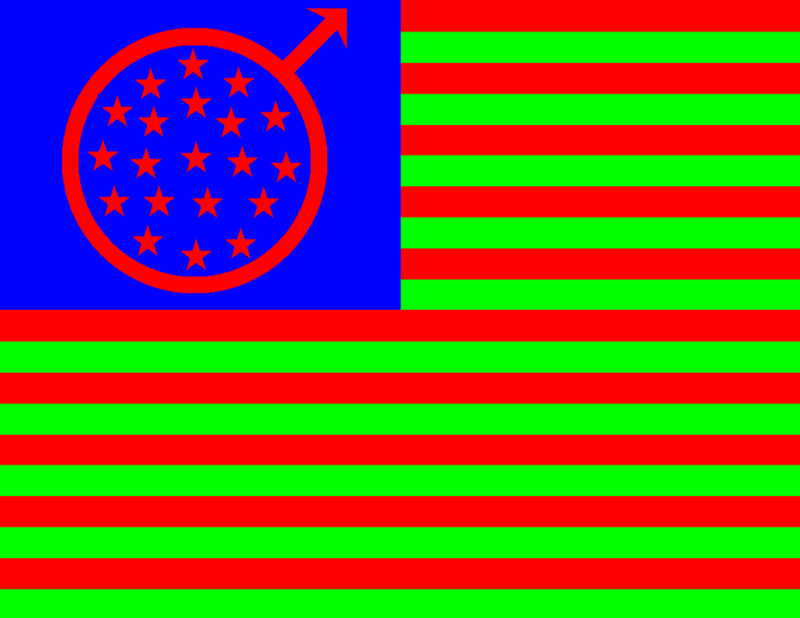 Its more complicated than the Martian tri-color, though it uses the colors red, blue, and green, it has 20 red and green stripes, one for ever state on Mars, a Mars planetary symbol on the blue field, and 20 red stars, one for each state, I've added 2 more to the original 18, one for Phobos and Deimos. I vote for Robert's corporate government. It carries the day, by a plurality of one. Really, the only thing the overarching government needs to concern itself with is preventing conflicts between settlements and making sure human rights abuses aren't going on. Anything more than that - particularly an attempt to steal the planet from everyone else with immigration restrictions - deserves the express delivery of a small asteroid. The central (planetary) government does not need to meddle in the local business of licensing land surveyors and establishing parcel boundaries. I wouldn't necessarily grant a township (6 mile x 6 mile square). Most cities in Canada and the US have irregular boundaries. Winnipeg has 3 major "lobes" that follow rivers. From downtown they extend west along the Assiniboine river, north-north-east along the Red river, and south-south-east also along the Red river. Transcona is a small lobe directly east from downtown, originally established as a separate town, but when several surrounding communities merged with Winnipeg in 1972, this was one of them. Transcona was a railroad town, the CN Railroad literally built their rail yard in a swamp. Land was cheap, and the black clay (Manitoba gumbo) means if there's a toxic spill it won't soak into the ground. Winnipeg today is roughly 12 miles x 12 miles, but with a lot of land between the lobes not part of it. Winnipeg is a major city, population 705,244 according to last year's census. On the other hand, Portage la Prairie is a town with a population of 13,304, about 49 miles from Winnipeg. That town is 1.5 miles x 1.5 miles. My concern is to keep municipalities small. They're towns or cities, not states. And homesteads in the outback will also be allocated by the central authority. And municipalities cannot have the authority to expropriate land outside their boundaries. Why not have states? I pointed out 18 geological features which could form the basis of Martian states, and add two more states, Phobos and Deimos, they orbit Mars and should be part of that Federal Republic as well. The most important feature is States Rights. States are the laboratories of the Federal Government, things are tried out in the states first. States provide the counterbalance to encroaching federal power. We need a balance of power between the three main branches of government to keep the system democratic and accountable to the people! Why do you want more politicians? Why do you want another level of government, establishing more regulation, more rules what you can or cannot do, more human parasites padding their pockets and their friends pockets by extorting money from you (called taxes). Another division to separate people into groups so they can be controlled. Groups that can fight against each other in war. War means average people die while politicians are safe in their huge mansions eating caviar, giving more excuse to increase taxes that you have to pay, take away civil liberties, and control the pions. Yes, I'm saying a lot of rich privileged people consider average citizens to be pions or "unwashed masses". You the average citizen is a slave, treated as a slave. Am I laying it on too thick? As I said, in my proposal the national government will establish minimal regulation. Thou shalt not kill, thou shalt not steal, other than that you're pretty much on your own dude. I said one national government for the whole of Mars and both moons. Outside city limits, no rural municipality, no local government at all. Just homesteads with no one to rule over them. I wouldn't necessarily grant a township (6 mile x 6 mile square). Most cities in Canada and the US have irregular boundaries. I am conceiving of a settlement as a small town that covers about 4 sections (4 square miles) and, in the surrounding 140 sections, dozens of family farms and ranches that produce food for the farmers and ranchers and for the people who live in the town. So, in terms of land use, a settlement would be predominantly rural. Where the four “town” sections share a corner, that is where the “Initial Point” of the settlement’s Base and Meridian would be located. establishing more regulation, more rules what you can or cannot do, more human parasites padding their pockets and their friends pockets by extorting money from you (called taxes). Most of the regulation occurs in cities. Cities are the most regulated places on Earth, I should know! I drive around in a crummy city called New York, there are regulations, regulations, and more regulations. Trying to go from point A to Point B means navigating through a series of one-way streets, and there are signs left and right saying you can't turn here or your can't turn there, almost all places where you can park for free are illegal parking spots or parking spots reserved for "special people" city workers, police, diplomats, commercial parking zones, and the mere fact that there is a parking meter and you put a quarter in it does not mean that the parking spot you've chosen is legal. To do the simplest thing, such as sell hot dogs, you need a vender's license. State governments generally don't bother with such minutia. In New York City, there is generally very little freedom to do what you want without going through many bureaucratic hoops, and paying users fees. So Robert, do you like polises, do you like being a tiny little speck in a vast crowd of humanity? Do you like the pushing an shoving and lines of people going everywhere, and traffic that just crawls? Another division to separate people into groups so they can be controlled. Coming from a person who lives in a country that is mostly cities and empty wilderness in between. You see in Canada, almost nobody lives in "fly-over country", you have 30 million people spread out over half a continent! Most of those people are city dwellers. Groups that can fight against each other in war. War means average people die while politicians are safe in their huge mansions eating caviar, giving more excuse to increase taxes that you have to pay, take away civil liberties, and control the pions. Do you know what happened to the Russian Czar's family, were they safe? The Russian Czar had a lot of Caviar, and you know how their lives ended? They ended when they lost a war, in front of a machine gun! Yes, I'm saying a lot of rich privileged people consider average citizens to be pions or "unwashed masses". You the average citizen is a slave, treated as a slave. Am I laying it on too thick? When there aren't any states and all the people working for government are working for the national government, there is no competition for those actually running that government, just ask Vladimir Putin about that, he stays in power because everybody else who might pose a challenge is working for him or is in hiding. The problem for Russia I the National Government has too much power, and the State Governments are just extensions of the National Government. The governors of the states are not elected but appointed by the National government! The Russian Federation is a Federation in Name only! No balance of power between the regions and the center, no check on central government tyranny! Most of the regulation occurs in cities. Oh, you're going to get me started. Winnipeg has done several things I really disagree with. Provincial government is supposed to have the primary responsibility to supervise cities, I really wish Manitoba would slap-down Winnipeg. Hard. And you don't think I can understand Mars? Don't you think Mars will be that? I lived in Toronto for 3 years; crowded with 35% more land area but 3.87 times the population. And surrounding Toronto are city after city after city. The Greater Toronto Area (GTA) is as crowded as New England. But Winnipeg is one big city surrounded by miles and miles and miles of nothing but miles and miles and miles. It's an 8 hour drive to Minneapolis, 14 hour drive to Calgary, or 28 hour drive to Toronto. Although in my 20s I did drive a sports car to Toronto in 23 hours. The largest city in Manitoba other than Winnipeg is Brandon, which grew to 48,859, and a 3 hour drive from my house without traffic. The largest city in Saskatchewan has grown to 215,000. The largest city in North Dakota has 118,500. The largest city in northwest Ontario, this side of the Great Lakes, is Thunder Bay with 107,900. So how is that working out for the Kennedy family? Or Bush? And now Trump? Your attitude is bizarre. I'm talking about restricting power, reducing the number of people who can control you, ensuring they can't control you like that. And it will be a very, very long time before the entire planet Mars has a population equal to a single American state. Mars is about starting again. Take the best of Earth with you, leave the worst behind. So it looks like there will always be disagreement about what's the best and what's the worst. But - best to leave as much of the nation-building as possible to the Martians. I would think when the population of Mars is less than a million, or there are less than a few hundred settlements, that the Mars Secretariat could still be a small, weak body and each individual will have opportunity to contribute to decision making. By that time they will be able to decide what to do - another layer of government, or something else, like direct democracy or whatever. I have another question entirely with all this great debate which I'm enjoying - what's actually the point of debating here, on this forum? How will these conversations contribute to anything meaningful? I'm still new in this forum so I don't know if anyone's involved who might be making 'real-world' decisions or influencing those who do, or many people who fully intend to settle on Mars. Several NASA employees are members of the Mars Society. And NASA administration noticed the Mars Society is effective at lobbying Congress to support their budget. So we are noticed. And a couple times when I criticized NASA too harshly, a NASA employee did point it out to me. I deleted a couple posts that I was told the NASA administrator himself took exception to. And Lockheed-Martin has stolen some of my technical ideas, but those are mostly when I bid on NASA contracts. So we are getting serious attention. My vision of Mars is of a planet covered with towns like “Mayberry”. Mayberry was a small town surrounded by people who were intimately connected to the ecosystem that supported their existence. Crime and corruption were comparatively low. I hope that there will not be more than a few large cities on Mars. And I hope that the capital city of Mars will be a sleepy, quite little town that hosts sessions of the Parliament of Mars once a year, and that those sessions only last two or three months. Many years ago, I was the Secretary-Treasurer of a nonprofit corporation. I lived in Sacramento County, California. I wrote and lobbied three bills through the California Legislature. I eventually resigned because of the extremely toxic social atmosphere that prevailed in the State Capitol. Corruption from wall to wall! So please do not think that state government is something that will protect people from corruption and government abuse. I am highly opposed to dividing Mars into states. Discussions about creating such divisions should be left to the Martians of the next century. Perhaps a useful way to influence NASA is to advocate for a greater partnership with private space. Most opinions I've seen suggest that SpaceX will get there first. Perhaps this is better discussed in one of the Underhill threads. Better yet, maybe we can come up with a draft outline for a Martian government in this very thread, pulling together the most workable ideas - looks like we won't agree on everything easily. Then work out what to do with that draft. One possibility is that if/when the SpaceX ITS gets operational, a contingent of Mars Society volunteer colonists will raise the money to buy up a whole BFR and put all these great ideas into practice. Anyone up for that? ... or has this been tried already? Either we compile one document by voting on each paragraph, or make several according to beliefs and views. Better yet, maybe we can come up with a draft outline for a Martian government in this very thread, pulling together the most workable ideas - looks like we won't agree on everything easily. Then work out what to do with that draft. APM (Association Planète Mars) is the French branch of the Mars Society. This is a quick schematic I came up with, assuming the basic idea of corporate government proposed by RobertDyck. 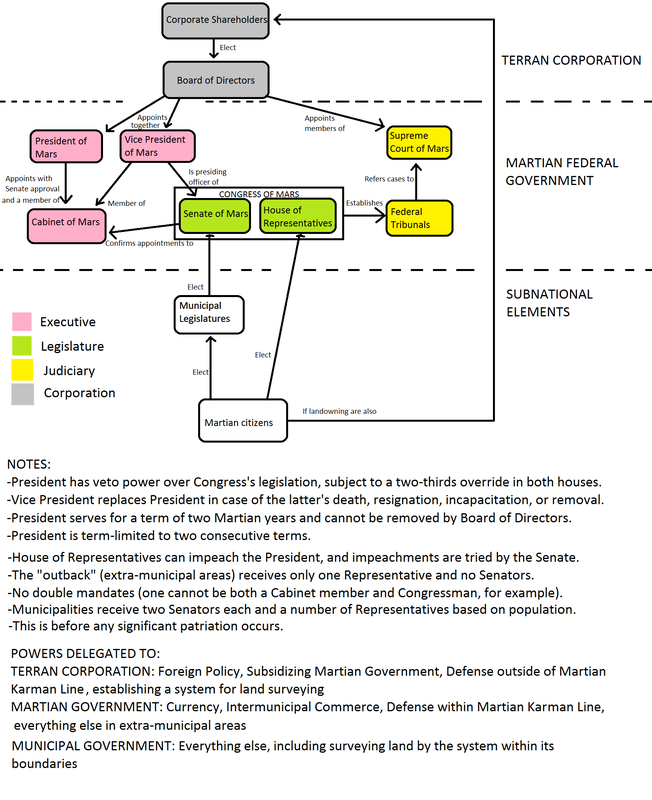 The structure of the Martian Government per se isn't that interesting or original, as it's virtually a carbon copy of the American System, especially pre-17th amendment. I think the bigger question is one of the distribution of power and authority between the three tiers of the corporation, federal government, and municipalities, which we can discuss here. I also think shares in the corporation should be attached to land ownership, especially in the early years, and that there should be gradual patriation as the planet grows and becomes self-sufficient. Apologies if this plan seems a bit baroque. This is a quick schematic I came up with... Apologies if this plan seems a bit baroque. You obviously put a lot of effort into your “schematic”. Your schematic is “a bit baroque” if by baroque you mean “characterized by grotesqueness, extravagance, complexity, or flamboyance”. What you are proposing goes very far beyond what is required to support the establishment of the first dozen settlements on Mars. Those settlers are not going to want to pay 50 percent of their income to support hundreds of government officials, who spend their days in lavish offices in a Capital District that is thousands of miles away, and who write millions of tons of regulations and more regulations and more regulations, etc., etc., etc. If that is the way Mars will be governed then I will not want to emigrate to Mars. A settlement might be governed by a Town Council composed of 5 or 7 or 9 members. The Council might elect a Chair, a chief executive officer, a records clerk, and a chief financial officer. The town’s laws might provide for the public election of a sheriff, a few judges, an attorney, and a grand jury. At the point when Mars becomes capable of governing itself, the town could elect a Member of Parliament (MP), who would represent the people of the town in the Parliament of Mars. Each settlement might be responsible for paying the expenses of its MP. The Parliament might be given the power to levy import taxes and to spend such taxes to pay for the operation of the national government. I am not proposing that these matters be prescribed by a Charter of the Government of Mars. The structure of a settlement’s government should be decided by the settlers. And the structure of the national government should be decided by the Martians. ... The structure of a settlement’s government should be decided by the settlers. And the structure of the national government should be decided by the Martians. Mars will have two levels of government: federal and municipal. The federal government will have jurisdiction over the entire planet: it's surface from pole to pole, from prime meridian around to the prime meridian, it solid material down to the core and very centre of the planet, its atmosphere, and orbital space, and both moons. Everything. If anything isn't listed, it's included. The second level of government will be municipal: town or city government. There shall be no countries, no states, no provinces, no counties. Territory of a town will be just the land of a typical town, it won't be permitted to extend territory to the size of a state. This means the vast majority of Mars shall be "outback", to use an Australian term. The "outback" shall not be governed by anything other than federal law. And federal law shall be extremely minimal. This will leave a lot of land for future homesteads or settlements/towns/cities. I did add in a third layer of the corporation, which is still presumed to be Terran, at least during the initial wave of colonization. The distinction between the corporation and the federal government is probably more artificial than I make it out to be, as by virtue of subsidies the Feds (so to speak) would be simple employees of the corporation. Since this is corporate government, the corporation will pay for basic federal services. No income tax, no sales tax, no excise tax, no import/export duties, no property tax. Of course space within a pressurized city or town will have fees. It could be a dome, or more likely a pressurized building similar to a mall. But if you set up your own homestead in the outback, no fees. A city or town may establish a driver's license; after all operating a motor vehicle within a pressurized building can be dangerous. But no driver's license required beyond city limits. I hadn't visualized it being such a copy of the American system. Canada has a Parliamentary system. There is no Vice President, or Vice Prime Minister. If the Parliament votes non-confidence in government, that forces an election. Whichever party has the greatest number of Members of Parliament voted to the House of Commons is automatically government. Originally, caucus would elect their leader, and leader of the governing party was automatically Prime Minister. This meant that caucus could remove him at any time. That didn't force a general election, instead caucus would elect a new leader, and he would become Prime Minister. Voters would only elect MPs. In the 1920s that changed; to empower average party members, the leader was elected directly at a party convention. That meant that caucus could no longer remove the Prime Minister. The only way to remove him now is for Parliament to vote non-confidence in government. That forces a general election, all MPs have to run for re-election. There are a number of problems with this; for one there is no mechanism to remove a party leader. There is an automatic leadership convention when a party loses an election, but until they do, the there is no way to remove a leader. Furthermore, each successive Prime Minister since party conventions were introduced has usurped more power away from Parliament. One giant mistake is the party leader has the right to veto candidate nominations. So instead of caucus choosing their leader and having power to remove their leader, it's become reversed. The leader can veto the nomination of any MP seeking re-election, and occasionally hand-picks a candidate. The leader technically does not have authority to appoint a candidate in a particular electoral district, but he can veto everyone else. This means do what the Prime Minister says, or your out of Parliament. MPs are supposed to represent voters to government. Instead in many cases MPs are asked to sell the governments position to voters. It's all backwards. But the point is Canada's system does not require any form of Vice President. If the Prime Minister resigns or is unable to complete his term, then either the party chooses another leader or there's a general election. Canada's senate is not elected. They're appointed. Britain's original system had a House of Lords and a House of Commons. The House of Lords represented rich nobility, while the House of Commons represented average citizens. Ancient Rome had a Senate, but nothing else. American was established with 2 houses, like Britain, but they were called House of Representatives instead of House of Commons, and Senate instead of House of Lords. America's Senate was originally appointed by state governments, not elected. Now they're elected. In Canada, the Prime Minister appoints Senators. For a long time Senators were "bag men", meaning individuals who successfully raised funds for the party. This was blatant partisanship, and seen as corruption, but no one could do anything about it. Canada's current Prime Minister chose to hold a competition, people applied for the position, then a committee vetted them. The Prime Minster held the final decision, but the process was strongly adhered to in order to avoid perception of corruption, and to ensure they weren't "bag men". However, since Canada's Senate is still appointed, most people do not want the Senate to overturn legislation passed by the House of Commons. It does proof-read legislation, and if there's a conflict with the Constitution or Canada's Bill of Rights, or if the bill would cause a problem with law, then the Senate sends it back to the House of Commons with recommendations. So the Senate is basically a proof-reading committee rather than an actual second house or house of sober second thought. Some Canadian provinces have simply abolished their provincial senate. Because the senate was seen as corrupt, or not allowed to do it's job because it wasn't elected, it was simply abolished. So now ask: why have a second house at all? The American constitution originally created the Senate to give states significant power over the federal government. But if there are no states, then why? Britain originally had a House of Lords because they wanted all the power. Further back in history Britain only had a Privy Council, composed of Lords who would advise the king; there wasn't any House of Commons. Do we need to retain any of that baggage? Why have a House of Lords at all? I'm suggesting no Senate, and no Vice President. Municipalities direct their attention to their own affairs, they don't get a vote for any body of the national government. Instead only citizens do. I'm not asking to duplicate the entire Canadian system. I'm saying to maximum term of office between elections rather than fixed dates. That means no need for a Vice President. If for any reason the President cannot serve, then a new President is selected to replace him. I would make land surveying part of the Martian Government, not the Terran Corporation. You would make the Corporation responsible for defence? At all? "Karman Line" on Earth means 100km altitude above the surface. Above that is generally agreed to constitute space. I recommend the Martian Government have jurisdiction over Martian orbit and both moons. I would not limit how many terms a president can have. Why? That was established after Franklin D. Roosevelt successfully won 4 successive elections. He died in office just months after winning his 4th term. Republicans didn't like that fact, so campaigned to amend the constitution to prevent anyone from doing it again. In Canada we've had many Prime Ministers elected more than 2 times. John A Macdonald was Prime Minister for the 1st Parliament. His list: 1st, 2nd, 4th, 5th, 6th, 7th. Wilfrid Laurier was 8th, 9th, 10th, 11th. Pierre Trudeau was 28th, 29th, 30th, 32nd. And others. Of course this is important when a term is not necessarilly 5 or 4 years. With more than 2 parties, you can have a Parliament where no single party has more than 50% of MPs. That's called a "minority government". If all opposition parties vote against the government, that can force an election. In Canada, minority governments often last about 1½ years. So it's important that Prime Minsters can be elected more than twice. In general, term limits exist to limit who voters are permitted to vote for. I disagree with anything that restricts voters. If voters want one leader, they should be allowed to re-elect him as long as he continues to maintain voter support. Double mandate thing is interesting. In Canada, it's tradition that cabinet ministers are Members of Parliament. Not a strict rule, but it keeps MPs happy. That keeps ensure the Prime Minster keeps support of his own caucus. But if elected by a board of directors, not caucus and not a party convention, then it's not necessary. Prohibiting double mandate actually sounds like a good idea. I had envisioned the President being the CEO of the Corporation. Until the death or retirement of the first President, the Corporation would run the entire Martian national government. Obviously that would transition to Martian rule upon his replacement: members of Congress would be elected by Martian citizens instead of appointed by the board of directors, and some means for Martians to select their new President. This would give the Corporation a hell of a lot of authority during the first mandate. This is the incentive for a corporation to do this, and for Terran investors to buy stock in that corporation. But as I said, transition to Martian rule upon retirement of the first President. You realize that even if you give Martian property owners stock in the Corporation, that rich Terran investors would have so many shares each that they would make Martian property owners irrelevant. They would be token only. Thanks for your feedback, RobertDyck. I being American tend to have an Americentric view on such matters, hence in large part the duplication of the American system. That being said, I thought of municipalities as federated sovereign entities in their own right, much like American states (albeit far smaller), hence the Senate. But I can see how that can be a bureaucratic inefficiency, especially given the minimalism of federal law. So I'd be open for a unicameral legislature. With that change it would then be the Supreme Court trying impeachments rather than the Senate. I'm similarly open to your concept of a maximum date, although it is somewhat at odds with the tradition of fixed dates in Presidential systems; perhaps upon the death/resignation/removal of the President the Speaker of the House acts as President until an election is held for a President to serve the remainder of the term. I actually agree with your ideas on term limits in general (hence why it's only a consecutive-term limit), I mostly included that to limit the Board of Directors in its selection of a President depending on how long it takes for patriation to happen. Speaking of patriation, I'm still unsure as to whether the planet would be mature enough to govern itself after the first Presidency (I'm used to them being only 4-8 Earth years), but then again it would likely be far longer and settlement would be much faster than what I'm thinking. As for the Karman line, I mostly included that as a dividing line between Mars (and its territory) and outer space, but the lunar orbits seem like a better idea. I stick by my decision of Terran control on most aspects of foreign policy, such as issuing passports and permits, although as a matter of protocol the President would be technically head of state. And yes, Martian property owners would likely be overwhelmed on the stock market by Terran interests, but I guess it's the thought that counts.